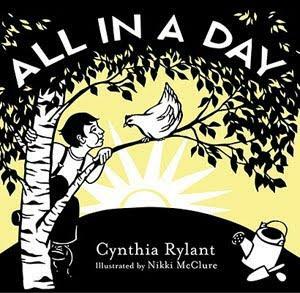 All in a Day is a children's book by Cynthia Rylant that helps kids understand time is fleeting without being dark or frightening. The book urges readers to make the most of each day because "a day is all you have to be, it's all you get to keep." Rylant, who has written over 100 children's books and has received such honors as the Newbery Medal, does this quite effectively. Her chief character is a little boy who does a multitude of things in one day, from tying his shoes and climbing a tree to helping his parents with the housework and lying beneath the sun. Rylant's short poetic lines are the perfect backdrop to his actions, as she writes, "A day is a perfect piece of time to live a life." All in a Day also features the artwork of Nikki McClure, a paper-cut artist who uses an X-acto knife to create portraits of people living their daily lives, which fits in perfectly with the theme of the book. Her simplistic black and white images, set against calm, pastel pages of light blue and yellow, add a peaceful tone that supports Rylant's non-threatening message. Children will not be frightened by the idea that all we have is today because it is presented in such a serene and matter-of-fact way. One of the best things about this book is it provides a safe way for parents or teachers to broach a serious, important topic with their children: mortality. The book is short—only thirty-two pages—but it makes its point without being overly preachy or didactic, something that can be very important when approaching children with short attention spans. The book ends with a simple, profound message: "So live it well, make it count, fill it up with you. The day's all yours, it's waiting now... See what you can do."